Coffs Harbour Garden Club: Neonicotinoid Products, You Might be Surprised! Earlier this week I wrote about the UN declaring the 20th of May each year as Word Bee Day. The EU has taken up the issue of harmful pesticides and their affect on bees and voted to ban the outdoor use of the neonicotinoid group of insecticides because they are so harmful to bees. It is not my intention to bombard with an overload of information but felt that the full list of commercially available products in Australia which fall within this group should be included in this post. Some of which are used in agricultural/veterinary preparations, however there are some that are used for the domestic market too that may be familiar to you. This information was sourced from the Australian Pesticides and Veterinary Medicines Authority. Agricultural seeds are treated before sowing and there is enough chemical absorbed by the seed to affect the mature plant, amazing! 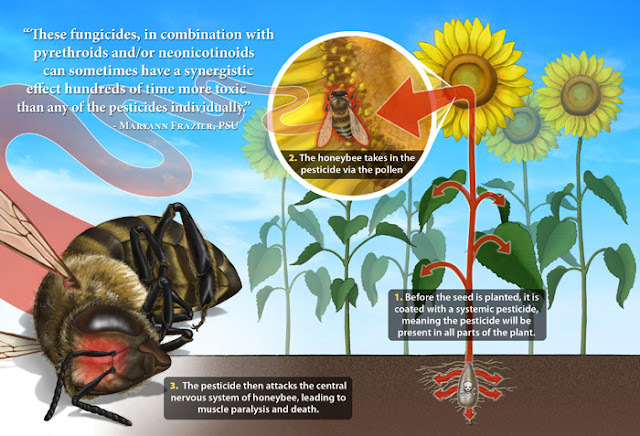 In direct application these systemic pesticides are absorbed by the plant's foliage, rather than just sitting on the surface so it spreads to all parts of the plant - that is the leaves, stems, roots, and flowers including the pollen. The tablet form (of Confidor) which is buried under (for instance) azalea bushes to control lace bug that disfigures the foliage poses the exact same danger to bees as does the spray form. Bunnings, Mitre 10, Woolworths and Coles have made the ground breaking decision to cease selling Confidor this year. Confidor, for instance is marketed as a control for aphids, mealy bugs, scale, thrips, whitefly and other sucking insects on ornamentals, roses and veggies. Most of these pests can be dealt with by horticultural oils, perhaps not as fast a complete knock down as Confidor, but none the less will give good results. It has been suggested that exposure to the chemicals affect the bees' navigational and immune systems, making them more vulnerable to parasitic infections, and ultimately resulting in colony collapse. Native bees are not immune either as they forage on crops and in our gardens too where these insecticides are used. Please be mindful that this post is being written from a home gardener's perspective and it is only my intention to make home gardeners aware just how damaging this group of insecticides are to bees (and potentially ourselves). Bees are the most important insect pollinators of flowers - they are absolutely essential for the production of agricultural crops, fruit, certain vegetables and flowers. They are a major link in the ecosystem and any threat to them is ultimately a threat to us too. We need to as a collective group, be proactive in preserving the health and vibrancy of bee populations. If this means that we don't use certain chemicals, this is a small price to pay (in my opinion) in the larger picture of preserving our bee colonies.